Bury star Emeka Obi has officially confirmed his transfer to Liverpool. "Liverpool have beaten Stoke to the signing of Bury teenager Emeka Obi [and] agreed a six figure sum with add-ons". "Pre-contract papers have all been signed [but] due to his Nigerian heritage, visa issues are currently holding up the move". 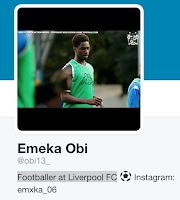 If Obi states he's a 'footballer at Liverpool FC' then it's safe to assume the deal is done. "He [Obi] is going to be an unbelievable asset to the football club. He’s a kid that’s really switched on, I’ve watched him while he’s been on summer holidays and he’s been in every single day". Welcome to five years of toiling away in the academy, before being loaned out to Huddersfield. Or Accrington Stanley.